We’ve just seen a Super Bowl Champion crowned in the National Football League which has always been the segue into the countdown for the Major League Baseball season. But as the NFL season has come to an end, while pitchers and catchers are preparing to report, MLB is missing something which is that their marquee free agents still have not found teams to play for in 2019. In recent years we’ve seen free agency become more drawn out as owners and general managers have been attempting to make veteran free agents sign on their terms which means taking deals with less money and less years. There were some observers who believed that this would somewhat change this year as with superstars in outfielder Bryce Harper and infielder Manny Machado on the market. But with Valentine’s Day right around the corner, both Harper and Machado are still not signed which is a huge problem that falls into the lap of Major League Baseball commissioner Rob Manfred. Last month marked the four-year anniversary of Manfred assuming his role as Major League Baseball’s commissioner and he has not gone out of his way to ingratiate himself to baseball fans in a positive way. Under Manfred, we’ve seen the Miami Marlins have another one of their fire sales; this time after they were sold to a group that includes former New York Yankees shortstop Derek Jeter which itself came on the heels of the Marlins receiving their new home ballpark in Miami (Marlins Park) which was built primarily on the back of the taxpayers in South Florida. In 2015, Manfred’s office failed to make a conclusive decision regarding the controversial slide in second base by Chase Utley which caused shortstop Reuben Tejada to suffer a fractured ankle during a playoff game between the Los Angeles Dodgers and New York Mets. Manfred has been big on improving the pace of play around baseball which has included eliminating the four-pitch intentional walk, while consistently balking at using a computerized strike zone to assist home plate umpires to make the proper calls behind the plate. And now MLB’s free agency issues are just another layer to the disastrous cake that Manfred is rapidly assembling. Major League Baseball has completely missed the boat on their approach to free agency as this is an event which should be celebrated instead of being shoved into a closet. The National Football League and NBA both make their first week of free agency a marquee event as star players in those leagues waste absolutely no time in signing big contracts. And in doing so, it creates excitement among fans, while also creating revenue as it generates ratings all across sports television networks. When free agency began in MLB this past November, there should have been blowout of epic proportions to showcase Harper and Machado, but this long drawn out process has sucked any excitement in the process out. There is one event that MLB considers their marquee event which is the Winter Meetings. 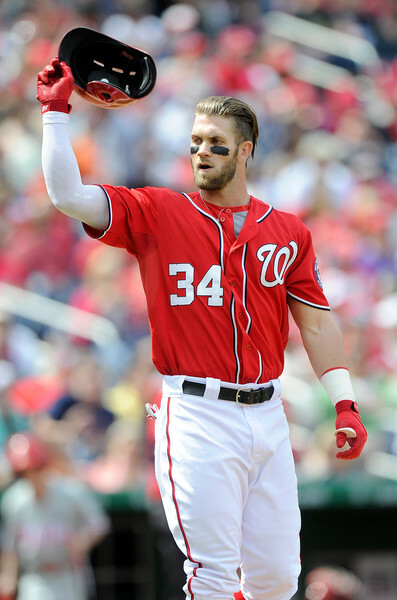 But when the Winter Meetings took place this past December in Las Vegas, no big names were signed as the event would have been the perfect time to ink Harper as he is a native of the city. Ever since Major League Baseball has implemented its stiff luxury tax, it has taken away the incentive for the big market franchises to spend money as they’ve made it more of a punishment than anything else. And because of that, teams are more focused on attempting to re-sign their own players instead of playing the market. In the case of Harper, the only teams that have shown interest in him this off-season are the Washington Nationals, Philadelphia Phillies, San Francisco Giants, and Chicago White Sox, while the White Sox, Phillies, and New York Yankees have also been in play to potential sign Machado. But this lack of movement on the free agency front is just another illustration that owners around Major League Baseball are colluding to not spend money in order to bring down player salaries, while also scaring other star players from testing the free agent waters. There has been a major shift in recent years by most teams around MLB to primarily focus on drafting and developing players. And by the time that these players reach arbitration, most teams are ready to kick these players to the curb while just repeating the process. Recently the excuse was that most of these players hit free agency after they’ve turned 30-years of age which would make a team reluctant to spend big money. However in the case of Harper and Machado, each player is in his mid-20s. I was shocked when the Major League Baseball Players’ Association decided to extend the contract of their president Tony Clark as his inactivity on the free agency issue is enough to make Marvin Miller roll over in his grave. Clark has talked a big game in regards to doing something, but actions speak louder than words, and he’s done nothing whatsoever which includes turning a blind eye to teams delaying a player’s MLB debut in order to delay his free agency. The current collective bargaining agreement between players and the owners runs through 2021, and MLB is steamrolling its way to a work stoppage. The owners don’t care because their money is protected since they all have other lucrative business interests which bring them money, and their focus will be to wait out players. And as the players will be looking to get their just due in regards to compensation, Joe Public (aka the working man) who actually cares about the sport will be the one who’ll get screwed. Most players are not old enough to remember Major League Baseball’s last work stoppage in 1994, while most of the current team owners were not in their current positions 25-years ago. But they don’t understand the disaster that they are headed to as their sport which was once considered to be “America’s Pastime” is now far from that. MLB is falling off in popularity as compared to the National Football League and the NBA which includes it being less appealing to the younger demographic. And MLB’s idea of improving their status is to muck up their game by adding a clock for pitchers, bring the designated hitter to the National League, and give their fans a watered down product. This is evident by the fact that most teams around MLB have already thrown in the towel for 2019 as they are set to begin the season with glorified minor league teams playing big league parks, while expecting fans to pay big time money. Like it or not sports is a form of entertainment, and the average theater buff would not pay Broadway-type money to watch an off-Broadway production. And with the start of a new MLB season right around the corner, the lack of buzz for it across the board is frightening.